Parents recognize Playmobil as a quality toy manufacturer with plenty of extras, details and room for imagination. Their castles for dragons and knights are right in line. Children of all ages love to pretend. The charm of watching them play with toys that stimulate their active imaginations is always rewarding, plus plenty of fun. The pretend world of dragons and knights and castles is a popular one for both boys and girls. Each of these castles from the world of Playmobil are designed for great imaginative play by children. 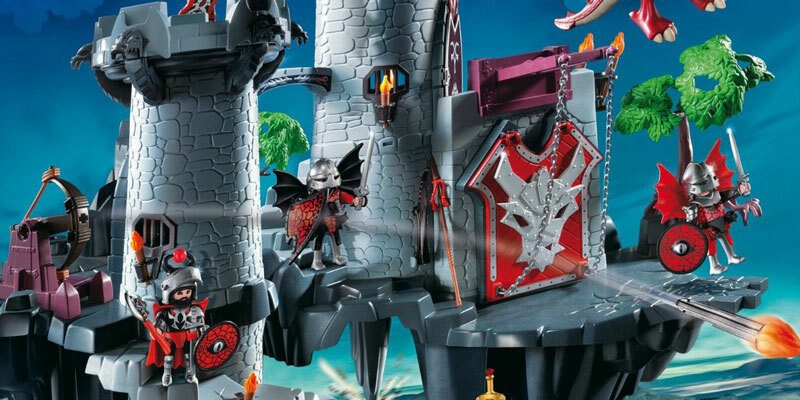 There is the large dragon castle to kick things off for a child, but the additions of the knight’s castle and dragon’s dungeon make a full playset. Each comes with play figures as knights and dragons, along with working parts like a drawbridge and firing canons. There is some assembly with these castles, so you need to be prepared to spend some time putting them together. I was able to assemble the castle the night before giving it to my grandchild, but that was well worth it! Talk about a delighted child. And the castle was ready to play with immediately. Not all toys are great for all age children. And these are not appropriate for those younger children. Small parts are included, so keep an eye on children under 4 years old who are still prone to putting things in their mouth. I gave the castle to my 4 year-old granddaughter. She is definitely old enough to enjoy the pretend world of castles, knights and dragons. But her 6 year-old cousin seems to have even more fun and there are plenty of little characters for both of them to play together. The details that Playmobil includes in all their toys makes pretend playtime even more imaginative. The castles are formed to nearly real-life look, as least as real-life as a toy this size can be. And the little characters are real enough the make even older children enjoy the play. Of course, Playmobil makes extras that go along with castles. At Dragon Castle Toys you can see lots more of these extras including a Viking ship that’s next on my list for my granddaughter.